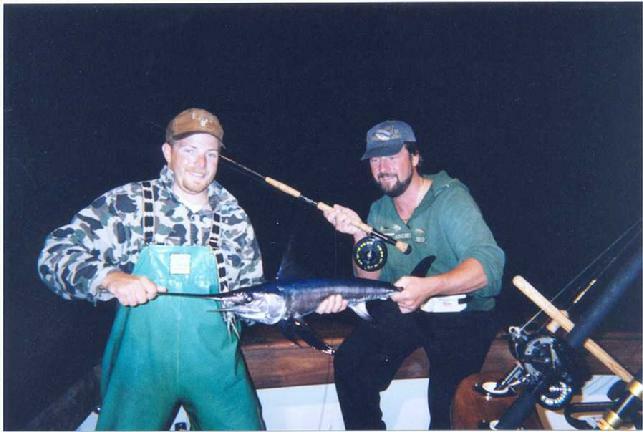 Billy Hayes, October 28 2002, First Swordfish on fly in the western Atlantic Ocean Baltimore Canyon off of NJ. Blue Marlin on Fly, Blue Marlin Fly Fishing School, Los Suenos CR, "Dragin Fly"
"Blue Marlin on Fly Schools"
During the last 6 years, we have experienced unbelievable Blue Marlin fishing, while fishing more than 140 miles off the coast of Costa Rica. Six summers ago, one boat raised between 14 and over 100 blue marlin per day during the 16 days which they fished this small patch of ocean. One angler caught as many as 18 Blue Marlin on fly in one day, and four or more per day on all but one day of the 16 days fished. 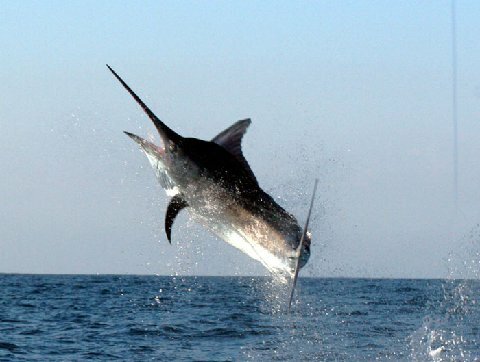 During late June, July, and early August of 2013, We hosted five clients at our "Costa Rica Blue Marlin Fly Fishing Schools" out of the Los Suenos Resort and Marina in Costa Rica, aboard the vessel "Dragin Fly". All five of my client/students caught at least 2 and as many as 6 Blue Marlin per school (Two 13 hour Days of fly fishing) with a total of 19 Blue Marlin caught on fly during four schools, this represents an average of close to 4 Blue Malin caught on fly per trip. All fish were caught using IGFA rules of fly fishing and 20 pound test class tippet. 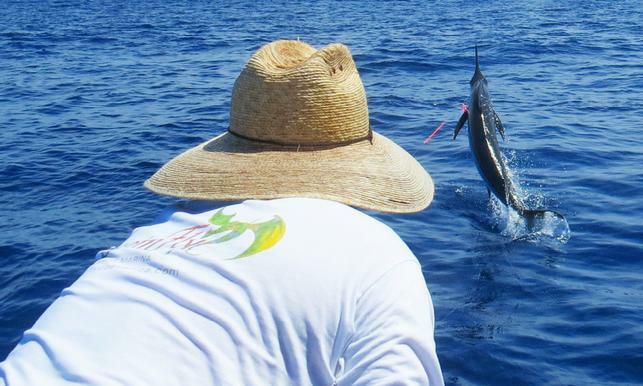 During June, July, and early August of 2014, I had six fly fishing clients who attended my Costa Rica "Blue Marlin on Fly Schools" aboard the vessel "Dragin Fly". Our success rate was pretty good, "every single fly angler that spent the four days at sea while attending my "CR Blue Marlin on Fly Schools", caugth between one and six Blue Marlin on fly". One client caught a grand slam, (Blue Marlin, Black Marlin, Sailfish, on fly ), while several others caught 3 or four blue marlin on fly during my school. During my 2015 "Costa Rica, Blue Marlin Fly Fishing School" season, one of my Schools produced 11 Blue Marlin, Two Striped Marlin, and 5 Sailfish on fly, one lady even caught a grand slam, Blue, Striped, and Sail, in one day, All clients caugh and released Billfish on fly, all but one caught between 2 and 11 Blue Marlin on fly! During my 2016 season we fished nine Costa Rica Blue Marlin Fly Fishing School trips, We caught and released an average of 5 Blue Marlin and one Sailfish on fly per trip, Every Student caught Blue Marlin on Fly. 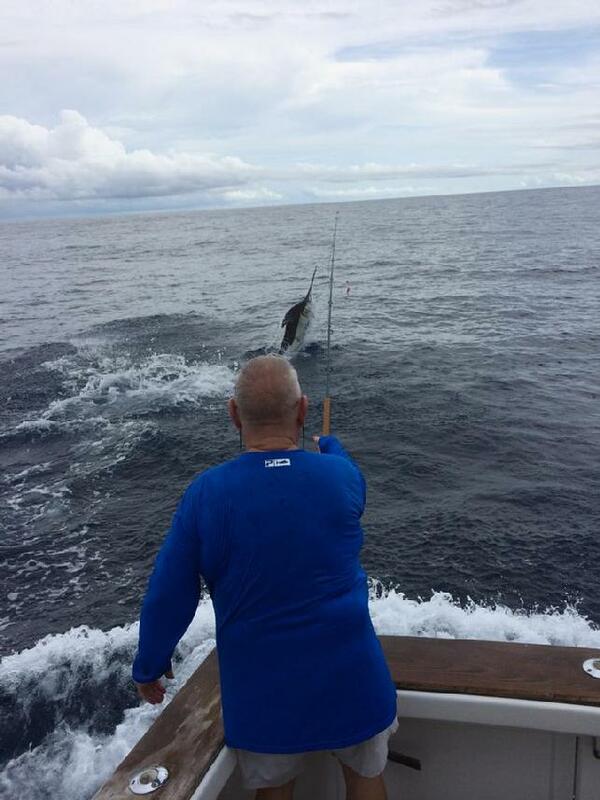 This year during July, while fishing with Hugh Chatham, I caught and released my fiftieth Pacific Blue Marlin on fly! During my 2017 sason, we had nine Blue Marlin Fly Fishing Schools with one trip cancelled due to my clients having famly health problems at home. 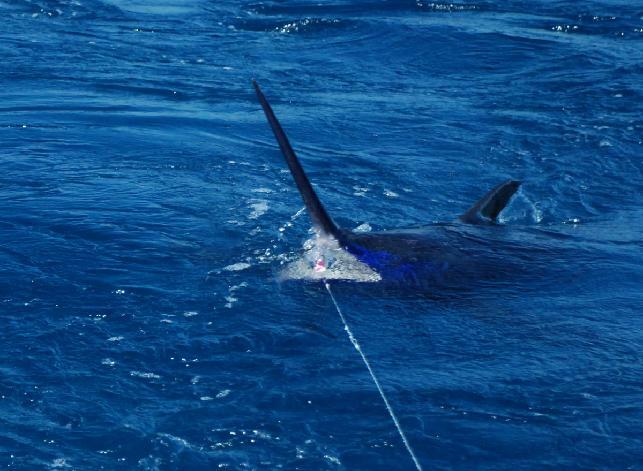 On the nine trips which we did fish, Blue Marlin were caught by all anglers on each trip. My clients averaged 1.5 Blue Marlin caught and rleased per day, close to 5 Blue Marlin caught and released on fly per trip. During our 2018 "Costa Rica Blue Marlin Fly Fishing School" season 57 Blue Marlin, 2 Striped Marlin, 7 Sailfish, and lots of small yellowfin Tuna were caught during our nine trips. On one trip we caughtand released 15 Blue Marlin several Sailfish and some Yellowfin Tuna during our 40 hours of fly fishing. My Students averaged more than 6 Blue Marlin caught and released on fly per trip, All fish were caught using IGFA rules of fly-fishing including 12 or 20 pound test class tippet. The location is near several differnt FADs (Fish Aggragating Device), located on mountain tops which come up from more than 8000 foot below the sea surface to 1,400 foot below the sea surface. The area which we will be concentrating on is the size of a city block, the FADs draw bait, and the Blue Marlin come here to eat. My plan for our 2019 season, which begins on June 7; is to fish this area during at least Ten, five day trips (Marlin Schools), in which we fly fish for at least 40 hours, ending September 7 of 2019. We will be fishing aboard the 43 foot Maverick, 'Dragin Fly" sport fishing yacht, with twin diesel engines, air condition, water maker, Ice maker, along with refrigeration, and a generator for electricity, out of the Los Suenos resort Marina in Los Suenos CR. On Day #1, Each student (angler)will arrive in San Jose,Costa Rica, be picked up by a private driver and transported to the Los Suenos resort & marina, where you will check in to my luxury condo on day one (Travel Day). On day #2 after provisioning the vessel, with food and supplies and our personal equipment, after we enjoy breakfast and lunch, we will board "Dragin Fly" in the afternoon and then head out to sea. After fishing from the time we depart until dark we will continue at trolling speed to conserve fuel all night. The Captain, two mates, and I will rotate on watch and sleep in shifts during the night while guests eat and sleep until we reach the location where we will fish, at dawn. On day three 3# we will fly fish for blue marlin from dawn to dark, and then eat and sleep while on a sea anchor. Day four #4 we wake up and fly fish for blue marlin from dawn to dark, then sleep while on the sea anchor. On Day #5 we fly fish from dawn to dark at the FAD , after which we will begin heading back to shore at trolling speed. On day #6 we will arrive in the early morning, back at the Los Suenos Marina. We will move into the condo at Los Suenos, clean up, have a great meal and spend the night there. Or the angler can travel home on Friday if wanted. Day #7 after breakfast, our driver will pick you up and take us back to the San Jose international airport for your flight home. These packages include private rooms (Lodging) in a luxury condo, ground transportation while in Costa Rica, charter of the boat (Dragin Fly) for entire trip, food and beverages while aboard "Dragin Fly", bait and tackle for teasing, breakfast at the marina. I will also supply all fly fishing tackle, flies and instruction, during this "Blue Marlin Fly Fishing School" along with accompanying the students throughout the trip. Some of my proposed dates for these schools are as follows; June, July, August. We also have other dates available for customized trips, also we offer extended stays where we can fish daily and stay at the hotel for daily rates. These trips are limited to one or two students per trip, per boat. All of these trips are to be customized to fit the needs of my students, call me if you have any questions or wish to put together a Blue Marlin on Fly School. For those whom need a larger vessel I also have a 50 foot Hatteras, along witha 57 foot Spencer available. Let’s get started, contact me now for pricing and to plan your Fly Fishing for Blue Marlin trip of a lifetime! 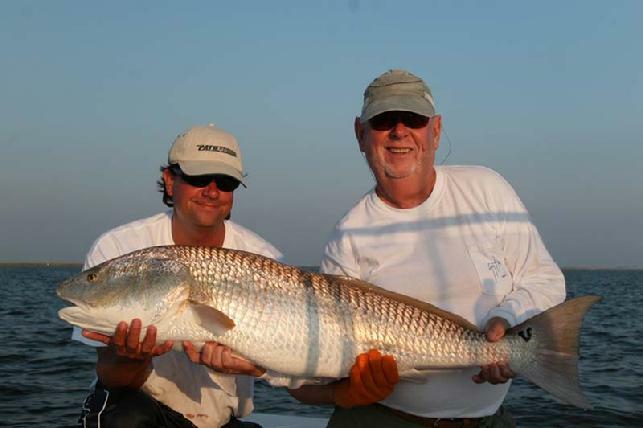 The Cape Lookout area of eastern North Carolina offers some of the best fly fishing for false Albacore and Giant Red Drum in the world! You should join me to experience these wonderful high powered speedster during October and November. I am now accepting reservations for September, October, and November of 2018. 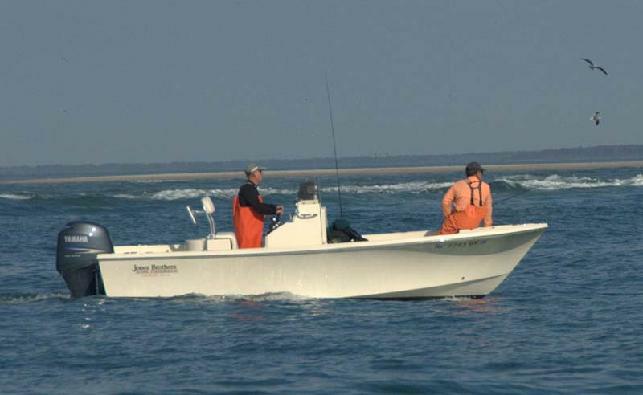 Fly Fishing for Albies & Drum charters in my custom Jones Brothers Cape Fisherman 2000 Guide Boat, "FLY REEL", full day Albie and Drum fly fishing charters here in the cape lookout area cost $800 per day, or $500 for a half day charter. Contact me for available dates. Please contact me for available dates for this 2018 season or if you want to join me to enjoy this awesome fly fishery.. 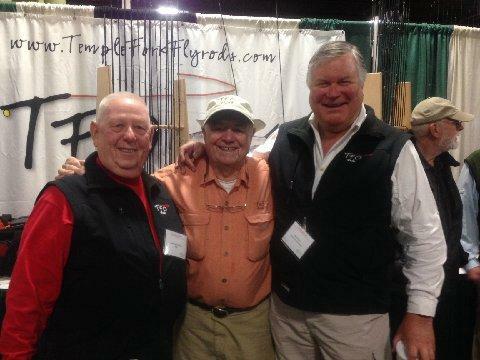 Customized, World Class, Fishing Vacations, and Fly Fishing Schools! If you do not now receive my updated fishing reports and you would like to, please send an E-mail to me requesting to be added to my (Blind Copy) "Fishing Report List". More than 8,000 anglers have requested to receive my Fishing Reports, this list is not for sale and it will not be used for any other purpose. Anyone wishing to be removed from this list should e-mail that request directly to me. For the most up to date reports, Friend me (Jake Jordan) on Facebook! "Eleventh Annual "Jake Jordan, Invitational, Sailfish, Fly, Challenge"
This is a good time to request a invitation to fish in this prestigious fly fishing for Sailfish event. The fishing dates are January 7, 8, 9, 2020 with a practice day/ arrival day being on January 6, and departure planned on January 10, 2020. The host location is the "Casa Vieja Lodge" in Guatemala, the finest fishing lodge in the world period! More information is available by clicking on the Billfish School tab on the upper left of this page. This tournament is limited to 10 boats. I still have several spots available for students who wish to attend my "Sailfish Schools" which will be held at The Casa Vieja Lodge in Guatemala, during January, February, and March of 2020, along with December of 2019. Please contact me or check out my "Billfish Schools" page for available dates should you care to join me for the best fly fishing for sailfish in the world. Check out and place your order for the new MAKO FLY REELS by Jack Charlton. The new 2020 prices and pictures are now posted on my Mako Reels page. Please contact me for information on fast delivery of most Mako fly reels. Order now for delivery before Christmas. 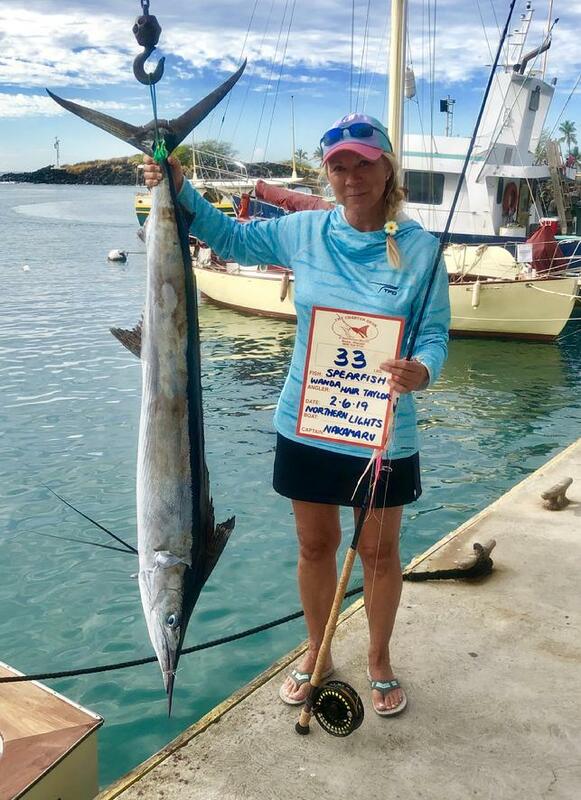 My "Fly Fishing for Marlin Schools" for Striped Marlin on fly will be held this year out of San Christobal, in The Galapagos Islands, Ecuador. We are constantly monitoring this fishery and book trips for those who want to fish in the Galapagos. 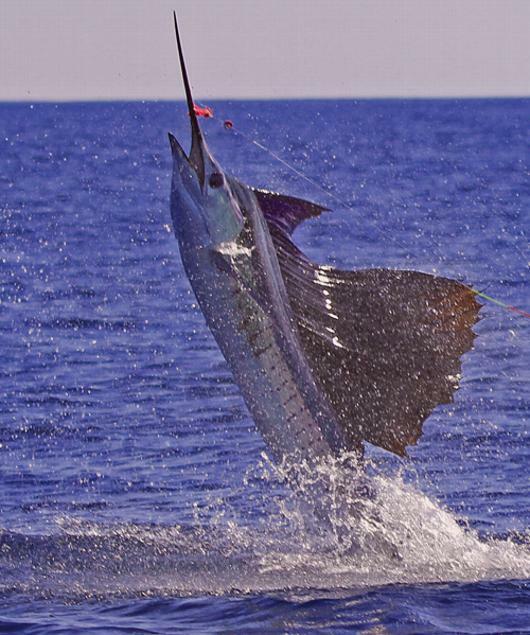 Look at December through April for the best Striped Marlin fly fishing. I am also looking at doing some Striped Marlin Schools near Mag Bay, Mexico along with down in Port Stevens Australia. Let me know if you have any interest? These are customized trips and require advancd booking. I have several Marlin School packages planned with duration of 5 or 6 days of fly fishing for Blue Marlin scheduled during March,April, and May of 2019, we will be located in Casa de Campo, Dominican Republic. We will be staying in 3 bedroom home near the marina, while fly fishing aboard the 48 foot G & S Sport Boat "Tradition", with Captain Tim Richardson. Please contact me as soon as possible as these exotic fly fishing for marlin packages will fill up quickly. Each Marlin School is a customized package with dates arranged based on being there during prime fishing periods. Call and reserve today! Captain Jake Jordan is now available for speaking engagements, PowerPoint presentations, and fly casting clinics to fly fishing clubs and fly fishing shows. Check out page 3 for more information or contact Jake directly to book dates. 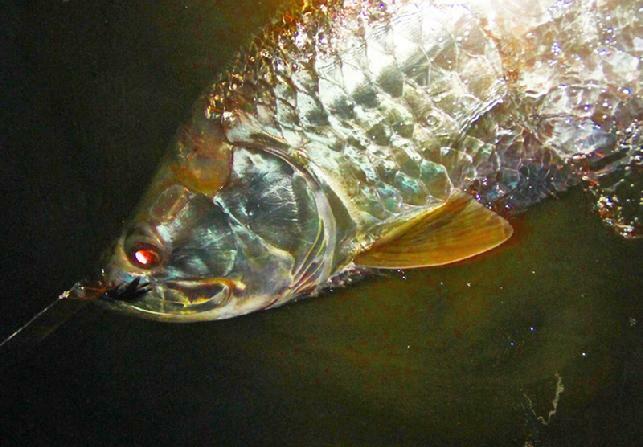 Fly fishing for Tarpon; The Middle Florida Keys offers the best fly fishing for Tarpon in the world. I am now taking reservations on prime dates during April, May, of 2019. I guide one or two fly anglers who want to experience the sheer power of these wonderful fish on a fly rod every night. This year I am offering catch & release Extreme Night Tarpon Fly Fishing charters, aboard my Jones Brothers Cape Fisherman, vessel "Fly Reel". I also have a second boat available this year for groups who have more than 2 anglers, please contact me for availability. Please click the link on the menu above for the latest Florida Keys fishing reports. For several dozen years Alaska has been my headquarters during September, I believe that Alaska is the most beautiful spot on this magnificent earth. September is prime time for giant Silver Salmon on top water flies which are to be found found near the Alutian Islands at 'The HooDoo Lodge. I offer customized "Fly Fishing Schools" and custom fly fishing vacations at the best locations to catch these awesome Silver salmon on dry flies. Contact me for available dates along with the latest information on this fishery. There are a few spots still available, contact me soon for information and pricing. Alaska is the home of the largest wild Rainbow Trout in the world. I know where they live and how to catch them. 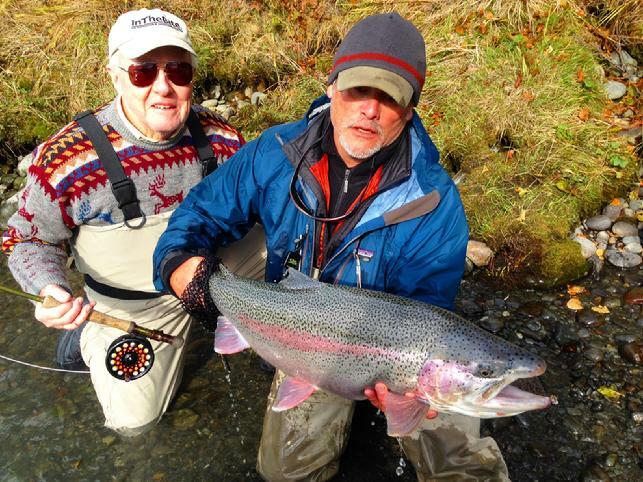 Join me in Alaska at Troutfitters, in Coopers Landing, during September, of 2018 and share the fly fishing adventure of a lifetime. Alaska Fishing reports usually begin in August. Contact me for more information or check out my Alaska information by clicking on the Alaska link on the upper left side of this page. Now Booking for 2018 season! Today is the best time to reserve your prime 2019 dates in Guatemala for my "Sailfish School" dates, during, January, February, March, along with December of 2018. I am also now taking reservations for "The Marlin School" . which includes, the best opportunity in the Atlantic ocean for Blue Marlin and White Marlin on fly. 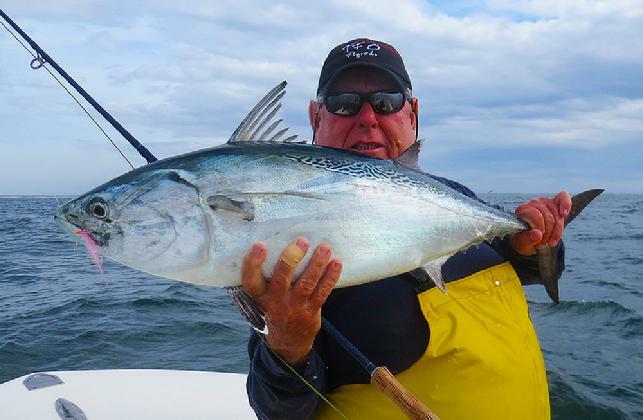 I am looking for a few good fly anglers to join me fly fishing for Marlin, (Blue) in The Dominican Republic during February and March of 2019. We will be fishing aboard a 49 foot G & S boat with Captain Timmy Richardson. Call today for more information, exact dates available, and pricing! The next chapter begins here, at 3:00 PM we were getting ready for the long two hour ride back to the dock, Ken, Greg, and George were sitting inside talking about this awesome day, I was in the cockpit with the mates when I heard captain Mike yell "MARLIN", "BIG MARLIN". I calmly picked up the TFO Bluewater HD fly rod with the Mako #9700 fly reel, rigged with a RIO Leviathan fly line , 20 pound tippet and a Cam Sigler Marlin Fly, with the drag set at one pound of pressure and got the fly ready to cast. Ken moved the sailfish rod out of the way, as I asked him if he wanted to take a shot, He said "You show us how it is done" so, when the big Blue Marlin came in hot I made the cast. The big Blue Marlin swam around trying to eat the teasers, I cast again, she swam under my fly and then chased another teaser which Flaco had cast to get her to come back in. I made the third cast and this monster fish attacked my fly within 25 foot from the boat. Within 10 seconds that marlin was 200 yards out gray hounding away and then back at the boat. Much of the next 30 minutes is a blur to me, I just did what I have been teaching anglers to do for the last 25 years of my Billfish Schools, "relax and let the rod and reel do the work" "don't squeeze the rod, loosen your grip, keep the rod tip low, when the fish is going away then the angler should relax, then apply maximum pressure on the fish when she is facing you". During the next half hour I ate some ice cold pineapple and drank 2 bottles of water, took off my sun glasses, and worked through several charlie horses in my legs, all while applying pressure on this big marlin. Captain Mike Sheeder who has caught 6 other Blue marlin on fly with me as his angler, maneuvered the "Intensity" perfectly, we circled that fish at least a dozen times as we tried to get an angle to bring her to the surface. At some point I was winding line in from behind the boat when she surfaced and jumped 3 times 100 yards in front of the boat, Mike swung the boat and I gained 250 feet of line and was on the fly line after an hour of battle. One hour and 15 minutes into the battle I got within 20 foot of her and then she ripped off 50 yards of backing, she really looked big to me. I was thinking about "Oh lord, this fish is so big and my boat is so small" and then I was wondering just what this Marlin was thinking? With cheering from Ken, Greg, and George, I began to feel that marlin start to tire, I had been resting and felt strong. I was on the fly line, just 25 foot from the leader and a release of another Blue Marlin on fly, the drag on my Mako reel was now set at 6 pounds and she was coming up slowly. At 4:23 I got the leader through the rod tip and secured the technical release, she surged and I let her have back 15 foot before stopping her increasing the drag to 8 1/2 pounds, and lifting her close to the surface, and then at 4:27 mike slipped Intensity into reverse one more time and I wound the fly rod tip all the way down to the class tippet, confirming that this was a really big female Blue Marlin. She was really thick and deep, and was longer than the transom of the Intensity is wide, the boat is about 11 foot wide, I think. I said that she was the largest fish that I had ever caught or even seen caught on fly, Mike said that she was well over 400 pounds, the crew agreed. We got in after dark. My 400 plus pound Blue Marlin, caught on 20 pound IGFA Class tippet, aboard "Intensity" with Captain Mike Sheeder out of Casa Vieja Lodge , just a few days after My Sailfish tournament set all kinds of numbers records for fly fishing for Billfish events, Made January 17, 2011 by far the best fish and the best day in my life. Thank you all for allowing me to share my passion with you, I do really love my job, more reports to follow. Captain Jake Jordan's Vessel 'FLY REEL" Jones Brothers Cape Fisherman 2000. looking for Albies at Cape Lookout NC.